I’ve been fortunate to have what most would consider a broad exposure to the world of art, and can appreciate a fine piece of artwork when I see it. 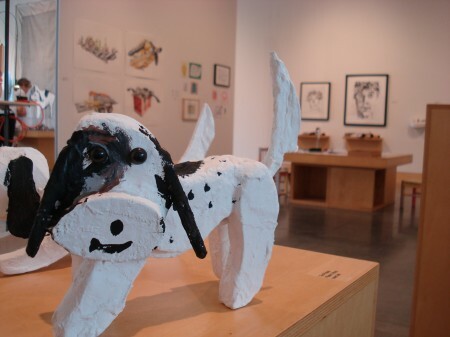 I’ve recently added another type of work to my list of “favorites”: kids’ art. Although always an appreciator of the beautiful spontaneity of children’s drawings, I haven’t always fully recognized and appreciated the viewer response they are able to evoke. All that changed last week. 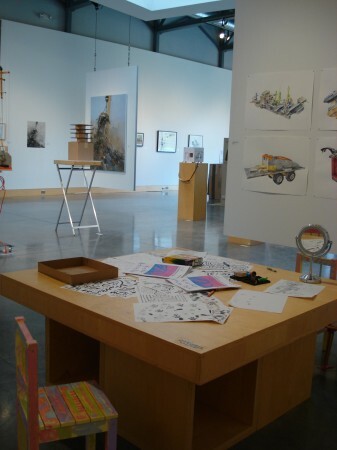 From the moment I stepped into the Father/Son Art Show (June 18-July 23) at the Minnetonka Center for the Arts, the concept of the show (and the innovative pieces in it) intrigued me. 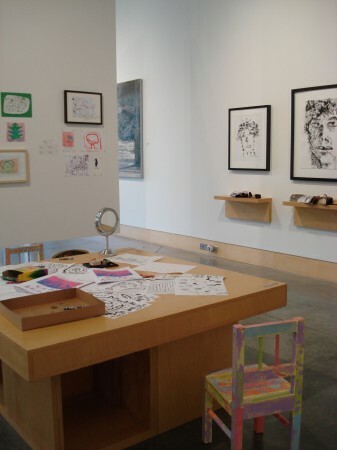 The basic premise of the exhibit is that four professional artists/dads (Irve Dell, Michael Kareken, David Lefkowitz, and John Schuerman) would display their work alongside that of their sons, ages 5-9. The result is a great tribute to the artistic efforts of these fathers and sons, but also highlights the work of young artists in a way that I’ve never experienced before. According to the Star Tribune article on the exhibit, the intent of the show was not to elevate the children’s work to that of ‘professional’, but rather to “celebrate the relationship between creative dads and their kids.” While I know the aim was not to force the children’s art to seem ‘professional’, the part that fascinated me most was that oftentimes the artwork seemed just that. Had I not known the ages of the young artists, there were some pieces I likely would’ve thought was an adult artist trying to capture raw, un-tapped emotion in his/her work. I think most people appreciate the unique beauty of children’s art, but viewing it on a refrigerator leaves a much different impression than when hung on a gallery wall. In a very healthy way, this exhibit forced me to reflect upon my own prejudices and assumptions about ‘good’ art and ‘skilled’ artists and admit that the work created by the hand of a child is able to impact me just as much as the work of a world-famous masterpiece. As talented as the artist fathers are, one thing that training and technique try in vain to match is the expression of a child. Oftentimes the uninhibited creative nature of children’s artwork is underappreciated and overlooked. It seems so ironic that adult artists spend years of their life chasing after the level of expression that came out so naturally when they were younger. Pablo Picasso was quoted as saying, “Every child is an artist. The problem is how to remain an artist once we grow up.” To that, I say, “Paint on!” Creative ability lies within each of us. It’s possible one’s greatest sense of artistic growth may come from looking backward rather than forward.